Mussels intimidate a lot of cooks, and I think it’s their beards. Now, I love beards on men—my husband had one (a goatee) when I met him—but not on my food. In this picture below, you’ll clearly see that beards in no way enhance the attractiveness of the two mussels on the left. So they need to be removed. All that’s involved is giving a little yank, and they tear right off. The mussels on the right don’t have beards. They are farmed, while the bearded fellows are wild. Kind of makes sense, doesn’t it? So does the fact that farmed mussels have smooth, shiny shells, while wild ones are craggy and rough and often have barnacles. Farmed mussels are raised responsibly and deemed a “Best Choice” by Seafood Watch, a reliable watchdog organization for our waters. (By the way, the site has a great pocket guide and app to help you make good choices when you are at the fish market). My daughter Rachel and I cooked farmed and wild mussels side by side. We prepared them exactly the same way to make the taste comparison as accurate as possible. I wanted us to prefer the wild ones, because it seems more PC, but I didn’t and neither did she. The farmed mussels were sweeter, more tender, and tasted more like the smell of an ocean breeze then pending low tide. Okay, back to the fast, cheap and easy part: mussels are all that and more. You can have dinner on the table in under 20 minutes and for about $5 per person. Mussels are low in calories and fat, a good source of iron and selenium, and are one of the few proteins with a decent amount of Vitamin C. But be warned—they are also fairly high in sodium. (See the chart after the recipe for more detailed nutrition information). Want to know how to tell the difference between male and female mussels? The males are pale white and the females more mustard colored. 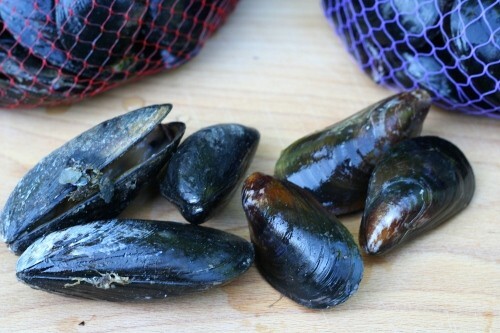 Keep the mussels in the mesh bag in which you buy them and place the bag in a bowl. Cover the mussels with a damp cloth or paper towel and place it in the back of your fridge, where they won’t be subjected to bursts of warmer air from the opening door. 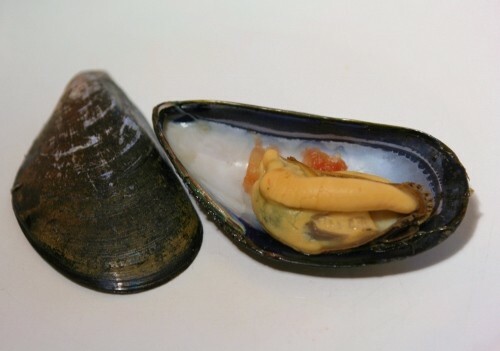 Do not immerse mussels in water or keep them in an airtight container. If they are fresh when you buy them, they will keep well for at least two to three days. 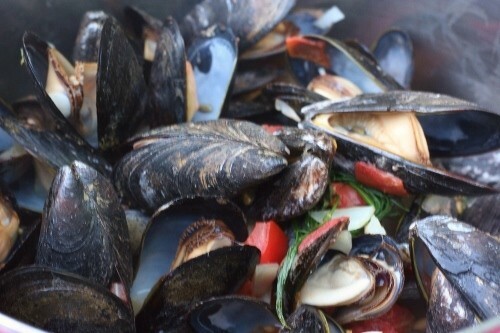 Before cooking, tap the shells of the mussels and discard any that don’t close. They must be alive when you cook them, and if they are alive, they will defend themselves against the giant rapping on their door by closing up. Rinse the mussels under cold running water, and yank (or cut) any visible beards (the hairy strings). Steam mussels in a little liquid (it can be water, wine, broth, coconut milk or any combination of those). 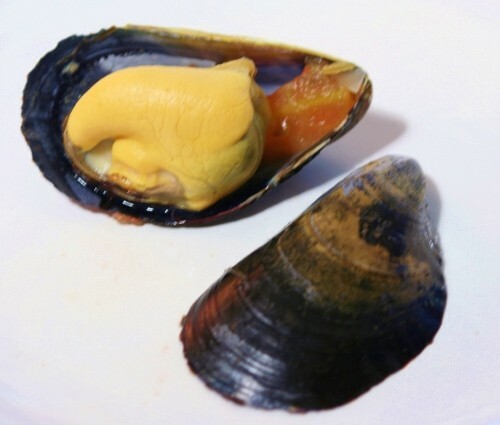 You don’t need a lot—the mussels can cook in as little as half an inch of liquid in the pot. The key is to cook them until they just open, usually 8-10 minutes. Overcooked mussels get chewy, so be sure to get them out of the pot when they open. 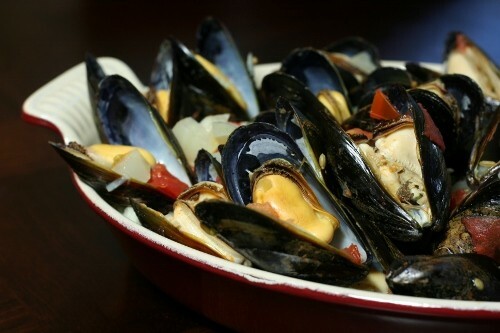 If a couple of the mussels don’t open after almost all are cooked, don’t wait—discard them. (Do not eat unopened mussels). And here is a close-up of one wild mussel (don’t be bothered that it is sitting slightly on it’s side: wild mussels can be just as plump as farmed). The shell is duller and less blue-green looking than farmed. And here is a close-up so you can see the difference in the shell, which is shiny and smooth. Serve with crusty bread and a salad for a complete, fast and healthy meal. If you don’t like fennel, replace it with 1 cup chopped onion and omit the fennel seeds. 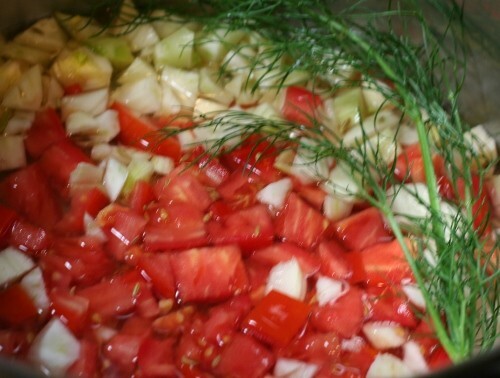 Combine the tomato, white wine, fennel bulb and fronds, fennel seeds and salt in a deep pot and bring to a boil. 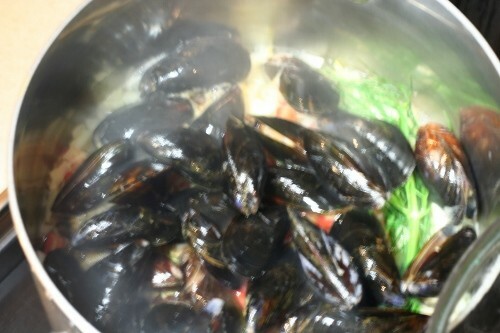 Add the mussels, cover the pot and cook until they open, about 8-10 minutes. (Discard any un-opened mussels and the fennel fronds). Spoon the mussels, broth and vegetables into dishes and serve immediately. *To crush fennel seeds, place them under a towel, cloth or piece of plastic wrap and roll a wine bottle or a can over them. Will cleaning them (pulling or cutting off the beards) ahead of time kill them? Can I do that before storing them in the fridge overnight if I purchase a day ahead? Do thye have to be “burped” like clams? Are “cultivated” the same as farm raised because I saw saw called cultivated but they had ugly beards. These are great questions! It is better to de-beard the mussels just before cooking them. In fact, it is best to disturb them as little as until you are ready to cook. And no, you needn’t “burp” them. “Cultivated” is another way of saying they’ve been grown or raised with human assistance– as in “farm-raised”. Mushrooms that are raised in small sheds under controlled circumstances are often also referred to as cultivated. Hmm, they had ugly beards? That is such a tempting phrase to pun, but I’ll keep it straight: farm-raised, or cultivated mussels can have beards, but they tend to be smaller and less frequent. As with anything, different farmers may use different practices which affect outcome. Most of the time, however, farm-raised mussels will be cleaner and shiner. I think the broth may be my favorite part! I always serve and eat mussels with a big piece of crusty sourdough bread to mop up all that broth.